For the first time, SpaceX on Friday blasted off both a rocket and a cargo ship that have flown before, a step forward in the company's goal to lower the cost of spaceflight. SpaceX has now managed to return 20 of its rocket boosters after launch, whether on land or on a floating ocean platform, as part of its effort to re-use instead of jettison costly components. SpaceX's live video webcast showed the two components arcing away from each other in the sky. The second stage continued to propel the Dragon toward the International Space Station, while the tall portion of the rocket powered its engines and maneuvered its grid fins to guide it back to Landing Zone 1 at Cape Canaveral Air Force Station. As live images showed the first stage glide down, steady and upright, from the air to the launchpad, cheers erupted at SpaceX's Hawthorne, California headquarters, where employees regularly gather to watch rocket launches. "That marks the second successful visit to and from space for this particular booster," said a SpaceX commentator on the webcast. SpaceX confirmed that the launch sent the Dragon into a "good orbit" and it was "on its way to the International Space Station." "This is the beginning of rapid and reliable reusability," said SpaceX Dragon mission manager Jessica Jensen, at a press briefing Monday. However, it was the first such effort for NASA, SpaceX's most important customer. NASA's ISS program manager Kirk Shireman said rocket experts from around the agency had reviewed safety for the mission, and that re-used components were seen as no more dangerous than new ones. "The net result is about equivalent risk," he told reporters Monday. The unmanned spaceship is packed with 4,800 pounds (2,200 kilograms) of food, supplies and experiments—including one to study thyroid cancer and another to grow barley in space. 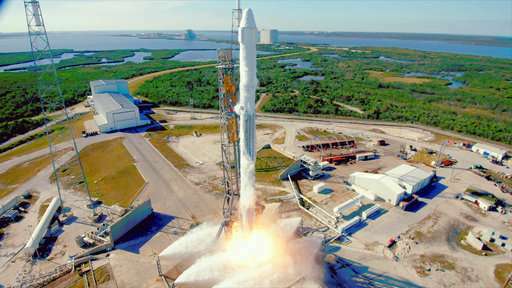 The mission is SpaceX's 13th of 20 under a $1.6 billion contract with NASA. And not a single Russian component! It would be interesting if the article provided some actual information. For example, exactly how much of the booster is recycled? The cost of the ready to launch recycled rocket vs. non-recycled? The fuel required to land the booster? Essentially a net comparison of costs between recycling rocket components compared to non-recycled. Recycling in general has proven to be questionable economically in many cases - just wondering if this is one of those cases. Why dont you do a little research instead of expecting to be spoonfed that sort of info in a PR news release? IOW what makes you think that that sort of info would be included in a PR news release? Dont you know how this site works?? But asking HERE will only get you ignorant answers from wacko theorists who think we are swimming in infinitely dense aethers, or electroplasma enthusiasts, or god channelers, or similar. This does not help the learning process. People who really want to know and help out will look for themselves and post links and excerpts. Big deal. The Shuttle was reusable and at least when the Americans had it, they didn't have to go begging the Russians for taxi-rides to the ISS. The Shuttle was also ten times more expensive than Dragon ($1.5 billion per launch vs $150 million). People who really want to know and help out will look for themselves and post links and excerpts. So what's wrong with asking for help with that? What's wrong with asking the guy who pumps your gas how to fix your car? -giving the impression that real engrs haven't factored rudimentary considerations like this into their cost analyses. No, asking for help here only gives amateurs the opportunity to expound on what they don't know. This is the internet. If you really want to know, GOOGLE IT. Shotman, the shuttle was much more expensive, but also much more capable. The cost per pound of payload is pretty similar for both, a bit cheaper on Falcon 9 but not too much (just Google it..), and the shuttle was also able to bring people and big equipment. However SpaceX approach is "promising" as it sounds that it could become much cheaper in the future. But that's it. It "could" happen, but it "has not" happened. Well the real reason no doubt is to develop the tech for powered landings elsewhere in the system. This, along with musks tunnel borers and the hyperloop, which operates at ground level mars atmospheric pressure, kind of indicates that he doesn't just want to send people to mars en masse; he wants to build cities underground for them to live in. If he makes a profit (and he will), so much the better. I see no problem. They often do know. It's got nothing to do with what the real engineers are calculating, but what Elon Musk is calculating. His engineers may well be saying it won't work, but he keeps saying keep doing it, because the investments and subsidies are coming in as long as it -looks- like it might work. You're again falling in the old fallacy of thinking that people smarter and richer than yourself can't make errors or fall into delusions, especially in a company culture such as Musk's where "underperformance" or saying it can't be done is rewarded with being sacked^. Contrary to your opinion he didnt make that up by himself. Do you ever perhaps wonder why you think you are a rational person but always tend to jump to premature conclusions? That in itself is indicative. But in addition, they often turn out to be false.